You could win a trip for two to The 54th Academy of Country Music Awards® in Las Vegas from Wheel of Fortune! Prizes/Odds of Winning: One (1) Prize. 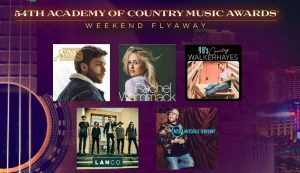 The prize is a trip for the prize winner and one (1) guest (“Guest”) to Las Vegas, NV to attend the 54th Academy of Country Music Awards (the “Event”). The prize components consist of: round-trip coach-class air transportation from a major gateway airport near prize winner’s residence in the forty-eight (48) contiguous states of the U.S. or D.C. to Las Vegas, NV (winner is responsible for transportation to/from the major gateway airport and air transportation may include one (1) or more stops); one (1) standard room (with a maximum of two (2) persons per room) for the prize winner and his/her Guest for two (2) nights; ground transportation to/from the airport/hotel/Event; two (2) tickets for the winner and Guest to the Event; two (2) tickets for the prize winner and Guest to the official ACM Awards After Party; and two (2) Sony Music Nashville Whiskey Jam passes. Travel (departure and return) must be completed between April 6, 2019 and April 8, 2019 or the prize may be forfeited, and an alternate winner selected (at Sponsor’s sole discretion). The total approximate retail value (“ARV”) of the prize is $4,200.00.